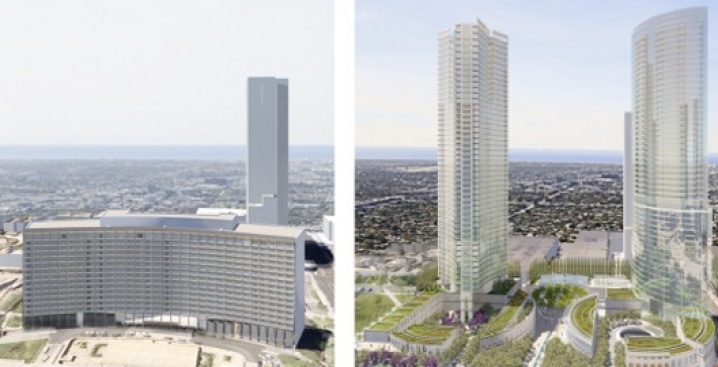 No, actress Diane Keaton didn't show, but here's the latest news in the tug of war over the Century Plaza hotel: The Planning and Land Use Management Committee (PLUM) voted to initiate a nomination to include the Century City hotel on the city's list of historical-cultural monuments, a move that sends it to a full City Council vote. Local developer Michael Rosenfeld wants to tear down the 19-story building and replace it with a two-tower hotel/condo development, a proposal that is being vehemently fought by conservationists who want to preserve the 1966 Minoru Yamasaki-designed structure. After the vote, we caught up with Rosenfeld, and asked if he was considering any alternatives at this point in terms of the project, or would continue to proceed with his original plan. If the City Council approves the nomination process, then the Office of Historic Resources will prepare a report for the Cultural Heritage Committee to consider, and then the hotel gets ready to do another dizzying loop through PLUM and the City Council again. If the city decides the hotel at 2025 Avenue of the Stars is historic, the project's historical significance would have to be considered under CEQA review.